The chemical composition of the Universe and the physical nature of its constituent matter are topics that have occupied scientists for centuries. From its privileged position above the Earth’s atmosphere Hubble has been able to contribute significantly to this area of research. All over the Universe stars work as giant reprocessing plants taking light chemical elements and transforming them into heavier ones. The original, so-called primordial, composition of the Universe is studied in such fine detail because it is one of the keys to our understanding of processes in the very early Universe. Shortly after the First Servicing Mission successfully corrected the spherical aberration in Hubble’s mirror a team led by European astronomer Peter Jakobsen investigated the nature of the gaseous matter that fills the vast volume of intergalactic space. By observing ultraviolet light from a distant quasar, which would otherwise have been absorbed by the Earth’s atmosphere, they found the long-sought signature of helium in the early Universe. This was an important piece of supporting evidence for the Big Bang theory. It also confirmed scientists’ expectation that, in the very early Universe, matter not yet locked up in stars and galaxies was nearly completely ionised (the atoms were stripped of their electrons). This was an important step forward for cosmology. This investigation of helium in the early Universe is one of many ways that Hubble has used distant quasars as lighthouses. As light from the quasars passes through the intervening intergalactic matter, the light signal is changed in such a way as to reveal the composition of the gas. The results have filled in important pieces of the puzzle of the total composition of the Universe now and in the past. During the servicing mission in 2009, astronauts installed a new instrument dedicated to studying this field. The Cosmic Origins Spectrograph is designed to break up ultraviolet light from faraway quasars into its component wavelengths, and study how intervening matter absorbs certain wavelengths more than others. This reveals the fingerprints of different elements, telling us more about their abundances at various locations in the Universe. Today astronomers believe that around one quarter of the mass-energy of the Universe consists of dark matter. This is a substance quite different from the normal matter that makes up atoms and the familiar world around us. Hubble has played an important part in work intended to establish the amount of dark matter in the Universe and to determine where it is and how it behaves. The riddle of what the ghostly dark matter is made of is still far from solved, but Hubble’s incredibly sharp observations of gravitational lenses have provided stepping stones for future work in this area. Dark matter only interacts with gravity, which means it neither reflects, emits or obstructs light (or indeed any other type of electromagnetic radiation). Because of this, it cannot be observed directly. However, Hubble studies of how clusters of galaxies bend the light that passes through them lets astronomers deduce where the hidden mass lies. 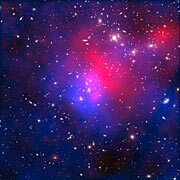 This means that they are able to make maps of where the dark matter lies in a cluster. This Hubble/Chandra/VLT composite shows how dark matter (in blue) and hot gas (in pink) are located far apart from each other during a cluster collision. One of Hubble’s big breakthroughs in this area is the discovery of how dark matter behaves when clusters collide with each other. Studies of a number of these clusters have shown that the location of dark matter (as deduced from gravitational lensing with Hubble) does not match the distribution of hot gas (as spotted in X-rays by observatories such as ESA’s XMM-Newton or NASA’s Chandra). This strongly supports theories about dark matter: we expect hot gases to slow down as they hit each other and the pressure increases. Dark matter, on the other hand, should not experience friction or pressure, so we would expect it to pass through the collision relatively unhindered. Hubble and Chandra observations have indeed confirmed that this is the case. In 2018 astronomers used Hubble's sensitivty to study intracluster light in the hunt for dark matter. Intracluster light is a byproduct of interactions between galaxies. In the course of these interactions, individual stars are stripped from their galaxies and float freely within the cluster. Once free from their galaxies, they end up where the majority of the mass of the cluster, mostly dark matter, resides. Both the dark matter and these isolated stars — which form the intracluster light — act as collisionless components. These follow the gravitational potential of the cluster itself. The study showed that the intracluster light is aligned with the dark matter, tracing its distribution more accurately than any other method relying on luminous tracers used so far. In 2007 an international team of astronomers used Hubble to create the first three-dimensional map of the large-scale distribution of dark matter in the Universe. It was constructed by measuring the shapes of half a million galaxies observed by Hubble. The light of these galaxies traveled — until it reached Hubble — down a path interrupted by clumps of dark matter which deformed the appearance of the galaxies. Astronomers used the observed distortion of the galaxies shapes to reconstruct their original shape and could therefore also calculate the distribution of dark matter in between. More intriguing still than dark matter is dark energy. Hubble studies of the expansion rate of the Universe have found that the expansion is actually speeding up. Astronomers have explained this using the theory of dark energy, that pushes the Universe apart ever faster, against the pull of gravity. As Einstein's famous equation, E=mc2 tells us, energy and mass are interchangeable. Studies of the rate of expansion of the cosmos suggests that dark energy is by far the largest part of the Universe’s mass-energy content, far outweighing both normal matter and dark matter: it seems that dark energy makes almost 70% of the known Universe. While astronomers have been able to take steps along the path to understanding how dark energy works and what it does, its true nature is still a mystery. The page on "measuring the age and size of the Universe" also has information on dark energy and how it relates to the expansion of the cosmos.